The rooflines have drip tiles shaped like bats, each decorated with five bats, representing the five blessings: long life, fortune, health, a love of virtue, and a painless passing. The Chinese character “fu” for bat is a homonym with the character for happiness. 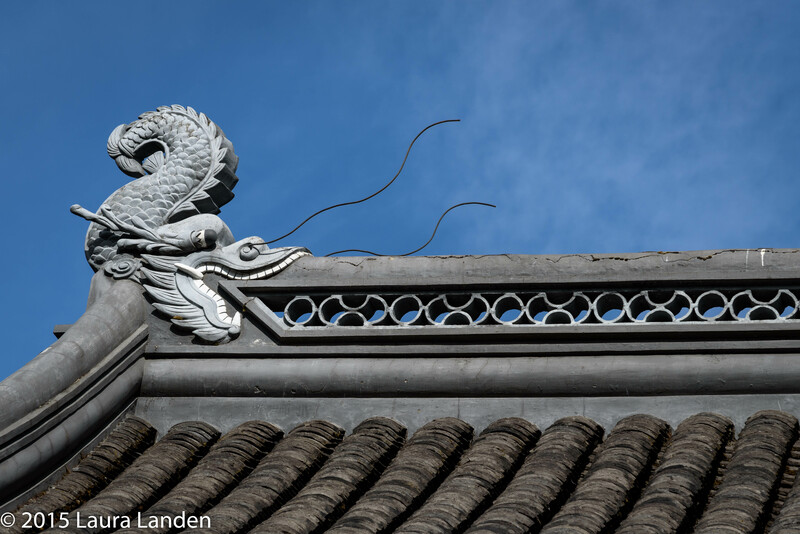 The roof itself is adorned with two dragonfish, or chiwen, thought to swallow all evil influences and protect the building from fire. 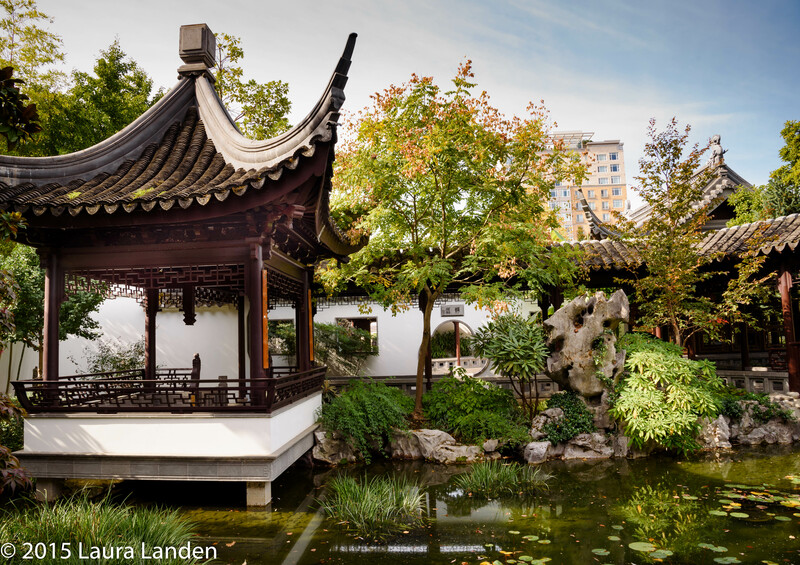 The garden represents features of the home of a well-to-do scholar. Structures include the scholar’s study, courtyard, and home. 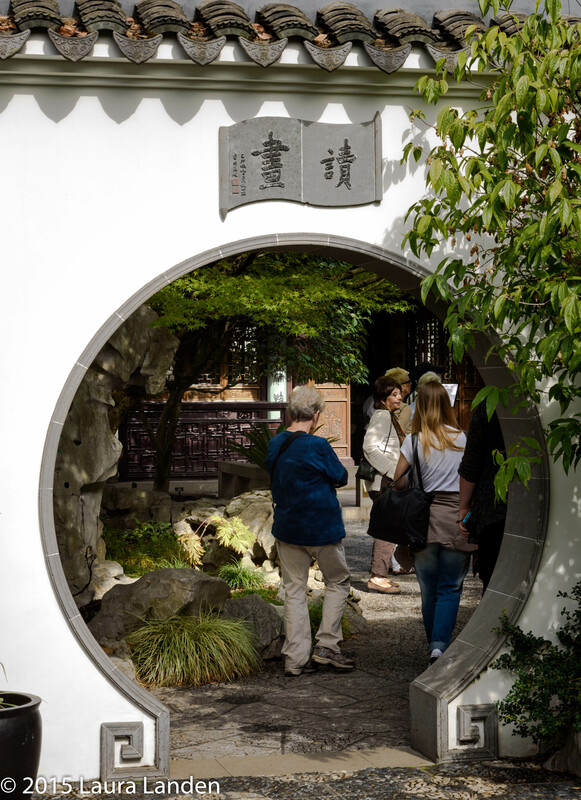 The doorway entrance to the scholar’s courtyard is the moon gate. The inscription pictured here is “listen to the fragrance.” Coming the other way one finds “read the painting.” Sources of meditation and symbolism abound. No mere stone walkways lead the visitor from place to place. Rather, the walkways are adorned with detailed mosaics, each symbolizing something different. What a sight it must have been to watch the Chinese artisans sitting and carefully placing each little stone in the sand. Throughout the garden one finds rocks from Lake Tai, all brought from China. Any size or type of rock will do, as long as it meets certain criteria. All are marked with inscriptions. 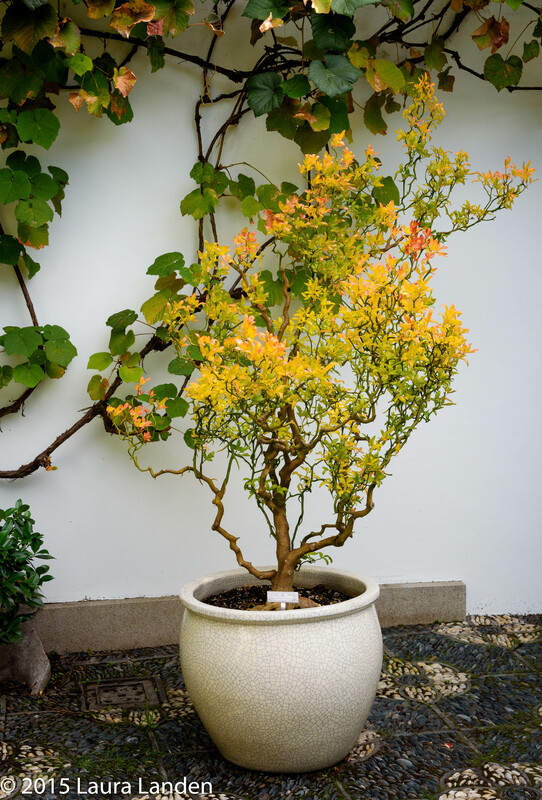 The garden boasts over 300 plant species, carefully selected to add beauty and meaning. Here is the Flying Dragon (Poncirus trifoliata). We enjoyed a delicious, light lunch at the Tower of Cosmic Reflections teahouse. Since we were there on a Tuesday, we were serenaded by a Chinese musician. Laura, it’s fantastic; thanks for sharing. So much to think on, a place to visit many times if possible so as not to feel overwhelmed all in one visit. Maybe next year I can make myself a pebble walkway somewhere here in my yard.